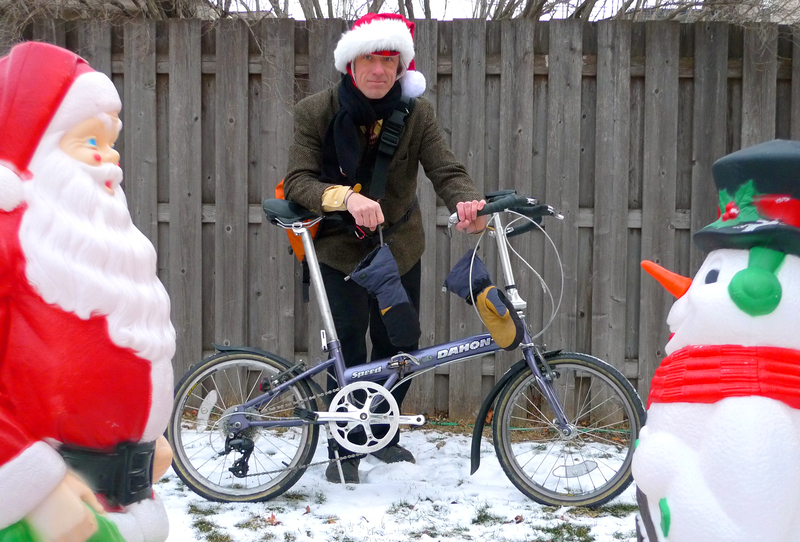 Santa and Frosty approved transport and outfit. Today after work I have plans to meet a friend for dinner and a movie, so I had to dress for the commute to work, for meetings at the office and wear something comfortable for the evening out. Since it was warmer (20 degrees F) when I left for work, I just wore some vintage wool baggies, a colored dress shirt, tie and sport coat. I carried my Milwaukee hoodie in my courier bag and I figured I could lose the tie and maybe even the sport coat after work. The colored dress shirt would look more casual than a white button down. In a further effort to look hip (At my age I need all the help I can get) I wore a pair of black Steve Madden Gatsby’s boots, which look sort of like combat boots but not enough so that I get stares at work. I really like these boots because they have fleece lining and grippy soles, so they are great winter riding boots. My friend was going to be driving and lives in my neighborhood, so I rode my folding Dahon instead of one of my full-sized bikes. This allows me to toss the bike in his trunk to catch a ride home with him after the movie. Yes I could pedal home, but it would seem anti-social to skip a ride with a friend who lives a mile from my house. I am trying to avoid the appearance that I am “extreme” or inflexible. In so many ways a folding bike is the perfect urban transport. It fits on any transit vehicle for one. It can come in to the office and wait under your desk if you lack secure parking, and it helps you hang with friends who drive cars. Okay, I love that you’re concerned about looking hip AND sporting a Santa hat. Ho, ho, ho!